This is not a restaurant review. This is the tale of a hometown adventure. My husband and I decided to try Sonoma's in Owen Brown last night. We had just enough time to have dinner before picking up our daughter from her youth group activity at the Interfaith Center. We had never eaten there, but it seemed like a no-brainer. It's right across the parking lot from OBIC. First impressions--it's one enormous room with an excess of tevevisions. And then, the realization: we have stumbled on to the Sunday football crowd. The televisions were loud, the patrons were pleasantly boisterous. We took a table and looked around for a waitress. We waited. And waited. And we began to worry that we wouldn't be finished in time to get our daughter. Our phones weren't picking up a signal for some reason so we couldn't text her. I began to think that our waitress/bartender was also the cook. My husband made an executive decision to pop over to touch base with our daughter. Almost as soon as he left, our food appeared. As I looked up to say thanks I noticed that the server wasn't our waitress but some nice woman from the table next to ours. "I used to work here," she explained. "I'm just trying to help out." My husband came back, we ate, asked for the check. As we finished, the mysterious woman from the next table appeared once more. "Don't write off this place because of tonight. She's really short-handed. I worked here for years. It's really a wonderful place." We heard her go to the waitress and say, "Take one of their sandwiches off their check and put it on my bill." Hats off to that poor woman who was running an entire restaurant by herself yesterday. And, to the angel at the next table, thanks. We'll come back again and give Sonoma's another chance. Maybe not during Sunday football, though. You'll be out the door in a flash. Your babysitter will be amazed. No popping out of bed for glasses of water. Just a restful evening of Netflix for her and an uninterrupted night on the town for you. Actually, the accompanying photo tells a different story. Date Night apparently means alcoholic beverages on the couch. Silly me. What was I thinking? No babysitter, no worries about who will be the designated driver. No expensive tickets for concerts, theater, movies. With parents working multiple jobs, feeling exhausted all the time, while trying to stretch every penny farther, a glass of red on the big comfy couch is about the best Date Night many folks will get. If you can get through the night without rolling over on a loud singing toy or stepping on a Lego, that's a win-win for everyone. I see a possibility for a marketing opportunity here. Any local companies selling couches need to get in on this. Imagine the improvements to Date Night and overall quality of life if you invest in a Really Nice Couch. Long enough to stretch out on. Wide enough for two people to cuddle. What am I saying? Nice couch? Kids? Just download the app already. Every once in a while I read a piece that makes me think, "Dang! I wish I'd written this!" This post by Grounded and Rooted in Love's Heather Kirk-Davidoff is just such a piece. Do we still want to live in a community where "the janitor and the CEO" live nearby each other, as Rouse famously said. Maybe we have gotten ahead of ourselves in our conversations about how to build affordable house or end homelessness. Maybe we need to back up and ask the kinds of questions that would help us to remember why this was ever a value to begin with. It isn't enough to say that Columbia means something. The knowledge of exactly what that is needs to be widely shared and the commitment to living that in our community life must be an active choice. It won't just happen. In 2012 I touched on this in the piece "Looking for Mr. GoodRouse." Rev'd Kirk-Davidoff looks at a marriage and a church community that stay the course by re-examining their commitment each year and making a conscious choice whether to continue. I think she's absolutely right that Columbia requires this kind of a conscious choice and active commitment. It appears that the tide has turned. The council has tired of disdain and will not take no for an answer. This is a remarkable turn of events. Terrasa and Ball are responding both to council concerns in dealing with the school system, and constituent concerns. They are taking a stand for more transparency and accountability. Meanwhile, a smaller story that has big implications is the news that Nayab Siddiqui, husband of BOE incumbent candidate Janet Siddiqui, is harassing poll workers for challenger candidates at early voting locations. Mr. Siddiqui and another member of the campaign have been following other campaign's volunteers, contradicting their conversations with the public, and shadowing them so closely as to make it impossible for them to have conversations with anyone. This borders on stalking. At the same time, someone (and I would suggest this is related activity) is concocting false Facebook accounts to troll discussions about challenger candidates, and is creating false sign-ups for poll volunteer shifts. This is truly vile behavior. These actions are being performed in support of the one candidate who favors the status quo in the Howard County Schools. These kind of desperate and unethical dirty tricks are the last gasp of someone whose desire to remain in power has absolutely nothing to do with public service. 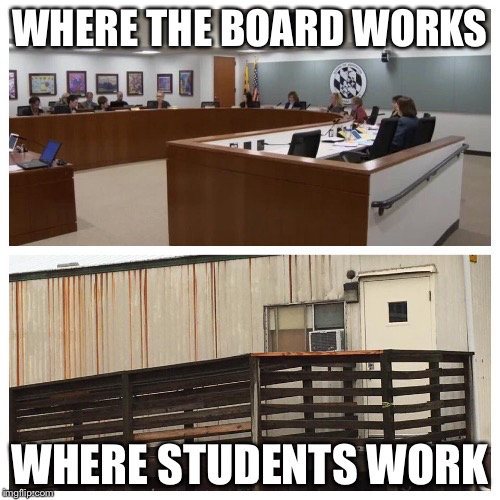 I wouldn't want to be in the same room with someone who condoned this kind of behavior, much less let them anywhere near Howard County education policy. Are we moving toward a new day for the Howard County Schools? The Magic Eight Ball over at my house says, "all signs point to yes." I'm looking forward to voting after work today. Today is the first day of early voting. I'm contemplating the steady bursts of BOE endorsements I've been seeing lately on social media. When I consider how long I've been agitating to get people excited about the BOE race, seeing all the buzz around candidates is gratifying. Finally, people are talking about the issues that are making a huge difference to our students, families and teachers. Despite my wish that the BOE race be respected as a non-partisan one, there are still plenty of folks making their choice along party lines. Strictly speaking, Dems with good sense are bypassing the incumbent and choosing the three other Democratic candidates. On the other hand, I've seen some Republicans recommending only the two R's. I don't know what the strategy is there, but in a race this important I wouldn't want to throw away even one chance at making a better board of education. I worry that a decision based solely on party lines shows less of a stand on values and more of a fear of "the other side." When it comes to our children, I wish we could be more broadminded for their sakes. Are we brave enough to allow diversity of opinion on a board that will be responsible for guiding a diverse student population? And then, of course, there are those who fear change in any form and I guess they should write in the incumbent's name three times, though I doubt that will do any good. HCEA has recommended candidates, The People's Voice has suggestions, too. Other endorsements are in the offing, I suppose. A good deal of research goes into those choices and I don't knock those organizations. But my advice is pretty simple: pick the candidates that will absolutely assure that Janet Siddiqui will not return to the board. Period. Does anyone really know how to calculate that? No. They may have theories, and they may have convinced themselves, but no one can truly know that in advance. So you must do your best work. I have faith in you to choose wisely. I leave you with my two cents. I've been looking at the candidates in light of the outstanding job Cindy Vaillancourt has done on the board. She is smart, thoughtful, responsive to parents and teachers. She is open to new ideas. Even in the face of outrageous personal attacks by other board members, she has persevered in her work. When they have gone low, she has stayed high. She has never lost her focus on students, teachers, and families. Of all of the candidates running for the board, the one who exemplifies these characteristics most is Vicky Cutroneo. Something else Ms, Vaillancourt and Ms. Cutroneo share: a highly developed sense of humor. Although not necessarily a qualification for the job, it certainly helps. I can't adequately describe my excitement as we near an election which can mean significant, positive change in our schools. Please be a part of that change. Talk to friends, neighbors, colleagues. It's been a while since I've done a true HoCo Holler. This upcoming event definitely deserves a shout out. Columbia Association has teamed up with the Howard County Library to host a welcoming event. They are reaching out to new Columbia residents. I think that's awesome. When you are new to Columbia, you don't automatically know about CA, or James Rouse, or Tot Lots or any of that stuff. I know that may be hard to believe to those of you who have been here forever. I'm convinced that the ongoing viability of Columbia rests in outreach to new residents. A kind of community evangelism, as it were. The idea of partnering with the library is brilliant. It's a true Village Green/Town² kind of partnership. The library system is a part of so many interesting and successful partnerships in the county. Who wouldn't want to team up with them? I'm hoping that the library's involvement will extend the reach of this event and bring the word closer to new folks in town. Here's the deal: this event can be a success only if new Columbia residents know about it. I'm guessing that Columbia Villages will be promoting this event, as well as Howard County Libraries. Knowing how good their outreach is, they'll probably get the word out in Columbia school newsletters, as well. If you live in Columbia, do you have new/relatively new neighbors? Tell them about it. Coworkers? PTA colleagues? If they are new to Columbia, let them know. Tell them they are invited. And let them know where CA headquarters is. There's nothing worse than getting lost in Columbia, MD. Believe me, I know. Oh, hey, and realtors who are selling Columbia homes--steer people in this direction, okay? It just might seal the deal. 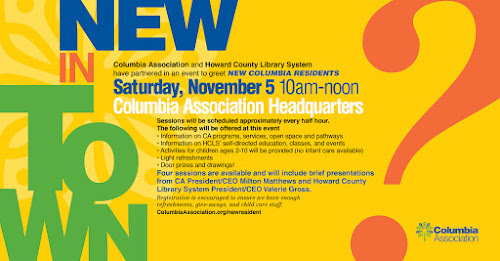 So, a big HoCo Holler to the Columbia Association and the Howard County Libraries. Here's hoping your event on November 5th is a huge success. Once upon a time there was an exhorbitant tax on British tea, and the colonists would have none of it. They stopped buying it. We tend to remember very public act of dumping some in the harbor. But it was much more than that: people simply stopped buying and drinking British tea. It was an act of protest against rule from afar that was based on taxation, but no representation. Boycotts as a means of political expression go way back in history. Certainly I remember several from my childhood and young adult years: boycotting California table grapes to support farm workers, boycotting Nestle products to protest unethical promotion of baby formula. 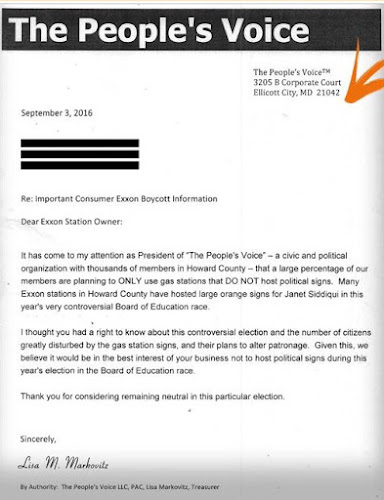 Communicating displeasure with a company by "voting with your feet" has been known to bring about positive change. That brings me to the present day, and the local gas stations posting the Janet Siddiqui BOE signs. I just can't bring myself to patronize those stations. The owners are certainly free to post those signs but, when I look at them and contemplate the outrageous lack of leadership and respect displayed by Dr. Siddiqui towards our community, I just can't spend my money there. This is a personal decision. No one suggested it to me. And I haven't engaged in any organized recruitment to boycott these stations. It's my own protest. You are welcome to think it is silly or ineffective. But it's my choice. 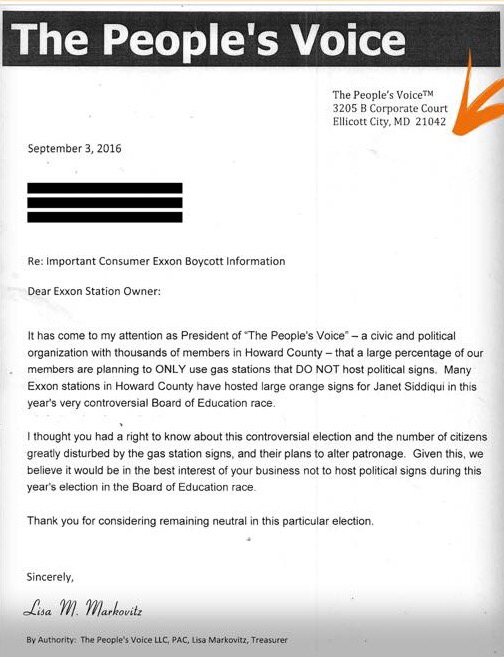 Lisa Markovitz of the People's Voice heard rumblings on social media of other people taking about a similar boycott. Out of a sense of professional courtesy, she sent the following letter to affected businesses. Yesterday Janet Siddiqui's team accused Ms. Markovitz of bullying small businesses. They suggested that what you read above was part of an organized boycott of businesses. All you have to do is read Ms. Markovitz' letter to know that these accusations are untrue. There are no threats. There is no organized boycott. There is no suppression of First Amendment rights. Her letter explains the situation in an effort to allow these business owners to make an informed choice. But someone on the Siddiqui campaign has terrible reading comprehension skills. That doesn't bode well for someone who wants to serve on the Board of Education. A simple compare and contrast assignment from high school would put this nonsense to rest. Citizens in Howard County are free to spend their money as they choose. 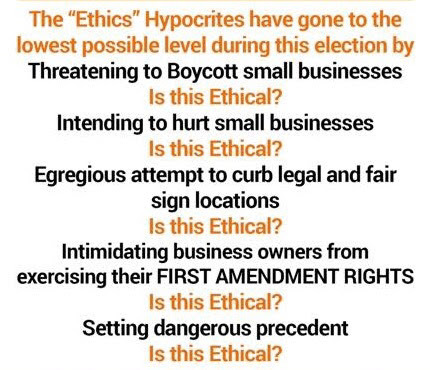 If they drive by gas stations displaying the orange sign, they are not bullying small business owners. Were the original colonists bullying the British crown? Good grief. It's hard to understand this move by Dr. Siddiqui when there are actual issues in this campaign that Howard County citizens would like to see addressed. Perhaps the reason Dr. Siddiqui spends all her time accusing others and deleting comments that don't make her look good is because she is unable to address those key issues. So she wants you to look somewhere else. Well, that's a product you certainly aren't obliged to buy. I've been following a discussion of Question A on Facebook. In case you don't know, Question A is an initiative to get big money out of County elections by providing public funding for campaigns. There's plenty of information out there, for and against. This blog post isn't about the merits of Question A. It's about how we fight. The women had questions, suggestions, gave answers that showed they had listened to someone else's post. The men announced, proclaimed, belittled, refused to accept any evidence that didn't agree with their own. To be clear, everyone entered the thread on their best behavior, but as soon as the actual exchange of ideas began, the difference between the men and the women was stark. Nobody reads Facebook for comprehension. Lighten up. I share all of this today to suggest that these gentlemen are not the best messengers for their message. Well, perhaps they are to other men, or to women who automatically pay them deference. But they showed themselves completely unable to persist in an intelligent exchange of ideas without resorting to negative language and unproductive arguments. Not all men, I want to stress. I certainly don't have enough evidence to suggest that. Just these particular men. They seemed to be operating under the illusion that they were going to tell us this brilliant thing, and then we were going to say, "Oh, that's brilliant." When that didn't happen, they got testy. And things went downhill from there. In closing, let me repeat this suggestion. I think it could be helpful. Don't be so quick to dismiss people whom you perceive to be opponents as laughable. Saturday's adventure took me out of the Bubble to Arlington, Virginia to a place called the Iota Club and Café. 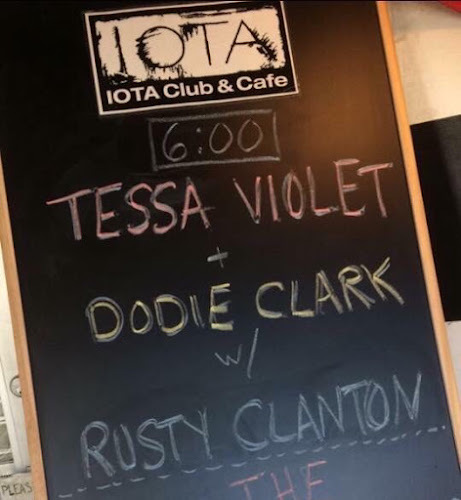 My daughter is a huge fan of Dodie Clark, a YouTuber singer/songwriter from England who is presently touring the U.S. with fellow YouTubers Rusty Clanton and Tessa Violet from Nashville. There weren't any shows scheduled near us. She was mightily disappointed. And then, on Thursday, an extra show was added. "It's only about an hour away!" So we went. Somewhere between my hatred of multiple variables and my deep gut feeling that this is what a Cool Mom would do, I found the emotional wherewithal to have an adventure with my teen-aged daughter. It was a beautiful day for a drive--sunny, blue skies--although the winds buffeted us a bit. We set the MapQuest app and off we went. The Iota Club and Café is in a bustling neighborhood of Arlington that boasts a Whole Foods, a Crate and Barrel, Pottery Barn, and plenty of other shops and restaurants. When we arrived, around four-fifteen, the area was filled with people. We easily found a parking garage and had about a block walk to the venue. As we waited for a light to change we were behind a little girl and her mother who were talking about going to "the Blue Playground." Is this where we are headed with Columbia? I thought. It was clear that it would be easy to park once and walk to shops, restaurants, and, in our case, a musical event. There were also on-street two-hour parking spots, as well as some parking lots for certain businesses. So people who wanted to drive had some options. I didn't notice a lot of bikers but we did see several bike-share stations in the area. It's also two and a half blocks from a Metro station. The club itself was probably the best place for me, as a suburban mom with trepidation about venturing out my comfort zone, to have my first club experience. They have a restaurant side with about a dozen tables, a bar along the back, and the concert space is separated by a curtain to give the dining room a sense of being in a different room. We got there early enough to have dinner. The food was quite good and reasonably priced. The service was excellent. At one hour before the show they collected money from those that were there for the show, and stamped hands. The Iota is normally a 21 and up venue. This event was an all-ages show, so they were scrupulously stamping adult hands vs. underage hands. It was a very, very good show. I have no idea how teens stand for three hours. I was glad to be on the restaurant side at a table, being a mom. I could probably write a separate post just about the music and the audience dynamics. It was a pretty amazing experience. As we headed back to our car I got to thinking about the talk I've heard about transforming Columbia's Tomato Palace into a music venue. At the time I couldn't visualize what that meant. Now I can. And I'm 100 per cent in support of that. Especially if they incorporate all ages shows into the mix, as Iota did. Wouldn't it be great if our teens could do more at the Lakefront besides getting their pictures taken for Prom? So maybe now I'm the Cool Mom. At least for a few days, anyway. And I caught a glimpse of something that could make Columbia cooler, too. 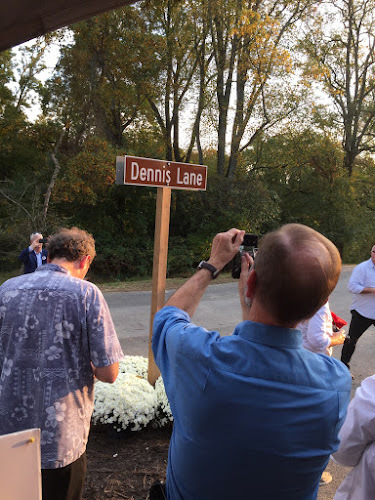 A name came up in conversation this week while I was at the event for Dennis Lane. That name was HowChow. We must have been talking about blogs that we miss. The disappearance of HowChow has left a big hole in the HoCo blogging scene, and the HoCo food scene. I had the great fortune to meet him once. You can read about it here. This post about pretzel rolls is probably my favorite. When I got home I looked at the last post, dated January 4th. Something caught my eye: the number of comments. There are 78 comments, and the most recent one is dated October 13th. So I started to read them. The story of the comment thread is, at first, a lament of the disappearance of HowChow. But then the community of readers that have formed around the blog continue the thread by sharing their own information about local restaurant experiences. In their own way, they are keeping the HowChow community alive. There's also a mention of a subReddit for Howard County food and restaurants. Hope Mr and Mrs HowChow are doing okay. Remember how HCPSS was being stunningly uncooperative the auditors from Howard County Government? It seems that they didn't do so well with the State of Maryland, either. I haven't had time to read the full report, but Bill Woodcock of The 53 has. His own highlights for sharing can be found here. One year ago I posted: School System in the News Again, in which I expressed some sense of personal satisfaction that my particular concerns with HCPSS--responsiveness, transparency, and accountability--were finally coming to the top of everybody's list. Guess what? They still are, one year later, and the school system has done little, if anything, to address this. Oh, they did build a better Board room. It's up to us to build a better Board of Education. On an unseasonably warm October afternoon, under a white tent, with food and drink from Clyde's, the hometown crowd gathered for a singular shoutout to our hometown's best. The music that played in the background was music that I knew well enough to sing along to. The guests were friends, important people, elected officials, people I used to be friends with, and people with whom I have sparred and from whom I have retreated. People I wish I knew. Such a world of people in just one gathering. "Dennis had a knack for gathering people," said Denise Geiger. And gathered we were, sharing a beer and a story, a tear and a hug. Listening to memories, one more time, of a man who meant so much to us and to his community. Watching Democrats and Republicans take turns at the microphone with ease and good humor did my soul some good. It was not a day for points and posturing. It was a day when your big, crazy, diverse family decides they are going to get together and get along. Just this once. Columbia and Howard County, Democrat and Republican, Downtown Development or not, Dennis drew us in. He shared his curiosity about the things that interested him. He enjoyed a good conversation and the opportunity to laugh. This place--Columbia and Howard County--is a better place purely because Dennis loved it, and because he invited us to see what he saw. There is now a street in Columbia called Dennis Lane. Like the sound of the ocean in a seashell, or a pearl in a oyster, there is a place deep in the heart of Merriweather that's an echo of his beautiful life. And he won't mind if the music is too loud or the Chrysalis is too green. His sister told us yesterday that she thinks he'd like to have a bench, though. Some of the streets in the Merriweather complex will be named after songs. Councilwoman Mary Kay Sigaty said that sometime in the future people will ask, "Dennis Lane-- what song is that from?" But we'll know, she said. That song was our friend. In August of 2007 a bright and talented young man left his home in Columbia to pursue his musical dreams at a college in New Jersey. By October he was dead: a heroin overdose. He was among the best and brightest that Columbia has to offer. I'm not going to dive into the particulars out of respect to his family. But I thought of him yesterday when he turned up in my Facebook memories and that got me thinking about the recent push in Howard County to address the opiate addiction crisis. 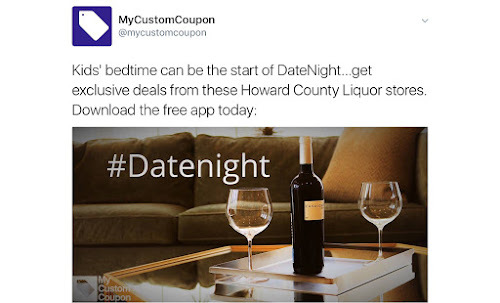 Alcohol and substance abuse happen in Howard County. It's easy to ignore if it doesn't touch you. Recently Laurie Lundy, a parent in Howard County, has taken to social media to get people thinking and talking about addiction. Ms. Lundy suggests that Howard County needs its own treatment facility for addiction. She has shared her dream of what it might be like. Howard County should build a State of the Art Addiction Treatment and Recovery Center, next door to a Recreational Facility for addicts in recovery. First it should be built on 20 acres of land with woods, a stocked pond, a jogging trail, and a barn for horses and equine therapy.The in-patient center will house between 40-50 clients. No more than 2 people to a room, each room has a bathroom. It will be co-ed. There will be offices, each with a window, for counseling, a meeting room for visitors, a kitchen where only healthy food is prepared, a dining room, and a family room with lots of couches, books, games, and a TV. There will be at least 2 dogs living there that the clients take care of. Then there is a separate recreational center for in-patient, out-patient and recovering addicts living in our community. The rec center will have an outside half court basketball court, a gazebo with bird feeders, a space for gardening, and hammocks. Inside will have a gym, a large room for yoga, and meetings, a cafe with tables, couches, and music, and a separate room with a pool table. Everyone at these facilities, should be treated with respect, compassion, and dignity. The responses to her ideas have been mixed. She has gotten quite a bit of pushback, along the lines of, "Why should people be rewarded for bad behavior?" We need to get serious about education initiatives to prevent future addiction. But we also need to educate the public about what addiction means, how it wrecks lives, how it can happen to anyone--even "nice" people. The editorial cartoon on this subject depicts a car meeting up with the Grim Reaper on Route 40. While there's nothing inaccurate about that, it reinforces that view that drugs are happening far from our suburban neighborhoods and schools. That's just not true. And it makes us feel more comfortable. We don't have to think about it. It's interesting to note that at this recent opiate addiction summit, the Howard County Schools were not represented. They didn't send anyone. HC DrugFree is hoping that there will be more collaboration in the future. Laurie Lundy has also started her own Facebook Group, Addiction Support in Howard County. Here's my write-up of the Q and A portion of the Columbia Villages Forum. I left at nine pm and it was still going on. I'm not sure how much I missed after that. As I left a parent was asking about the Wellness Policy and Recess; I'm sorry I didn't catch the candidate responses. 1. Question for Janet Siddiqui: Why did you not respond to repeated requests asking that parents be permitted to participate in special education work groups? Delmont-Small: You need to be able to advocate for your child. Parents should be allowed to participate in those work groups. Ellis: It seems that special education parents always have to fight to get what their child needs. Coombs: The recent practice of outsourcing legal services has led to unnecessary and punitive litigation. We are fighting families instead of treating them with civility. Miller: Parents shouldn't ask and ask again. We should be responding until we get closure. Letting things hang is not acceptable. 2. Question: In recent years we have seen a shift of focus away from students and families. Teachers have experienced a decrease in professional autonomy. What would you do to move power away from central ofice to schools? Delmont-Small: HCPSS has become too much of a top-down institution. They don't want to hear from schools. We need to get out of the way of the teachers and let them do what they do best. Coombs: I'm concerned that experienced educators are leaving. New teachers lose mentors. Teachers feel spied on, micromanaged. Treat teachers as professionals. Educators should be at the table when decisions are being made. Cutroneo: Board member described materials of instruction as a "want" but expensive programs like Gallup as a "need". These priorities are wrong. Ellis: Transparency is necessary for teachers, too. They need to know what is going on. Miller: Return focus on teachers and classrooms. Allow time for students for hierarchical skills, give time for teachers to engage parents. Cut back on paperwork/data collection that interferes with the process of learning. Reduce the amount of standardized testing. 3. Question: Is the Superintendent's contract public information? 4. Question: Rancor in the school board--targeting individual board members. How would you promote better relations? Specifically to Siddiqui: please list the ways you have stood up to bad behavior and actually worked to promote good relationships on the Board? Miller: Board Meetings have become like soap operas. We need to be respectful of each other. Stop bad behavior as soon as possible. Ellis: Begin by requiring parliamentary procedure and the appropriate manner of speech. This must be applied consistently. Staff must provide complete and timely answers to Board Members when they request information so they can make informed decisions. Cutroneo: Diversity of opinion should be respected. Be in charge of your own behavior. Delmont-Small: First we need to establish the proper relationship between Board and Superintendent. It is the Board that takes the leadership role. Coombs: Bring maturity back to the board board meetings. Now they are too unpleasant for students to attend. 5. Question: Do you support the teaching of (Darwinian) Evolution? Cutroneo: Yes, I support the science. Siddiqui: Yes, I support the separation of church and state. Delmont-Small: That's what we teach, but I wouldn't tread on parents' teaching something different in the home. Miller: I support a scientifically-based approach. 6. Question about Mold contamination at Glenwood Middle School. Cutroneo: No, HCPSS never contacted health department. * First contact with Health Department came from parents trying to find information. School hid knowledge of mold from parents. Ellis: First priority should be health of students and staff. Important to share information, follow up, diligence in complete remediation. Coombs: Now classroom teachers are required to do training on Indoor Air Quality and perform more work doing 30-point inspections. This should not be their job. Delmont-Small: The mold problem is a symptom of a larger problem. School system needs to communicate, not withhold information. 7. Question: Gave testimony--received no response whatsoever. How will you address showing that you are doing what you say you're doing? Accountability. Siddiqui: Apology, Vice-chair is supposed to respond. Says she wants more dialogue. Coombs: We need to give a better response. People feel disrespected. Also Superintendent shouldn't be running the Board meetings. Delmont-Small: Speaking at Public Forum is like speaking to wall. Speaker should receive a written response that actually means something. Each speaker should be assigned their own "point person" on the board. Answers to speakers issues should be posted on website. Miller: A best practices protocol should be established. Ombudsman should have the power to mediate and bring about closure. Cutroneo: Speakers at Public Forum face a brick wall in re transparency and accountability. There should be follow-up. You feel like nobody's listening to you. Ellis: I agree--having one person to respond, plus a timeline for responding and resolving issue. 8. Question about early college high schools, with priority given to those first in their families to attend college. Ellis: Needs to learn more about that. It's important to find ways to reduce college debt. Coombs: we need to address the turf war between hcpss/hcc. Cutroneo: We need to think outside the box. We need vo/tech back. Look at IB, individualized options. Delmont-Small: The more options the better. AP classes aren't the answer for everyone. Investigate outside our boundaries, what are other jurisdictions doing with success? Siddiqui: We have a college program at Oakland Mills High School. We're expanding opportunities at ARL, many new programs, but It's important they go to college. 9. Question: Tax money for schools. What happened to the casino money? Why is there a budget shortfall? Cutroneo: I want to pursue that and find out more about that. There's so much we don't know about our money and how the school system is using it. Delmont-Small: The State switched the casino money with prior moneys, replacing the funding. In reference to HCPSS budget difficulties: school system moves money around in mysterious ways. Ellis: The Governor hasn't released money earmarked for education. Miller--Those funds are allocated at the state level, come from state coffers. Coombs: We need to work on relationship with the state, with the Howard County Delegation. 10. Question: How to improve diversity in teaching staff? Coombs--We should look at hiring from HBCU's. Delmont-Small: : We need to attract but also work to retain. Board has to give the directive, make it a priority. Siddiqui: We're working on it and we're automated. We should push our students towards teaching, it's an honorable profession. Didn't support increase in class size. Cutroneo: Everyone loses if you don't have diversity in teaching staff. But when you have 30 kids in a class, no paraeducators, and little autonomy, you aren't offering those teachers a decent job. Ellis: The hiring and retention of minority teachers should be given more than lip service. We must be sensitive to minority student needs. 11. Question: Elementary School Model? Coombs--Teachers are actively discouraged from giving feedback. ESM took away from Music and Art instructional time. Cutroneo: No data has been shared. We need to see the data! That we only offer such an expensive initiative in very few schools speaks to equity. We need a collaborative, not a top-down approach. Siddiqui: Referred to preliminary data. Delmont-Small: We need to see the data. I want to have an understanding of what is really happening with ESM. Teachers should be involved in decision making and giving feedback. Ellis: Educational fads come and go. Open classroom and pods are gone. I'm looking for the data to be shared with stakeholders. Miller: Any data gathered to this point can't be conclusive in the short term. World language piece could be done better, needs to be changed. If this was a test, it's clear that Dr. Siddiqui and the challenger candidates studied for completely different tests. While the challenger candidates responded directly to the questions, Dr. Siddiqui often veered completely away from them. To be fair, the challengers can rely completely on what they hope to do, and that can't be fact checked. Dr. Siddiqui can truly only speak to her record. It would have been extremely helpful if 1) Dr. Siddiqui truly responded to the questions that were asked, and 2) had been truthful. Sad to say, there were a number of times throughout the evening when she made statements that were verifiably untrue. (For example, the comment about the health department.) In a time when the community is looking for responsiveness, transparency, and accountability, Dr. Siddiqui appears to be running on a platform of "just take my word for it." I found it extremely telling that she could not list one example of standing up to bad behavior on the board or working for positive relationships among board members. Not even one. Kirsten Coombs had a polished but relaxed style, perhaps a little too familiar in tone. (But that's a matter of individual taste.) She has clearly done research on the issues. Of interest--the issue of outsourcing legal counsel, how losing experienced teachers impacts newer teachers. One thing I didn't understand: what's the turf war between HCC and HCPSS? Vicky Cutroneo started out nervous in her opening statement but grew more solid as they evening progressed. Her answers to questions were informed by her work as a parent advocate and collaboration with other parent advocacy groups. Of interest: her assertion that the focus of mold remediation in schools should begin with looking at the documented health problems of students and staff, also her statement that when we don't have diversity in teaching staff, everyone loses. One thing I didn't understand: I'd like to more about how she would work to change the present budget priority mindset she referenced in Question 2. Christina Delmont-Small is passionate and articulate. Overall, the most poise and presence of all the candidates. Of interest--her enthusiasm for a budget as a policy document, her ideas for improving Board Response to Public Forum participants. One thing I didn't understand: her answer to the question about the teaching of evolution felt a little "off" to me. I'd like a little more clarification. Mavis Ellis didn't project a big presence but her quieter, low-key approach was imbued with a lot of experience and perspective. Her experience in education, from the classroom to national committees, informed her answers. Of interest: her perspective that ESM might be another one of many educational fads she has seen come and go, and her call for responding to minority student needs. One thing I didn't understand: her response to question about civility on the Board addressed staff not responding to Board member requests. I'd like to learn more about how that connects to the question. Robert Miller has got to be, hands-down, the most polite, reasonable candidate running. You get the feeling that he gives everyone the benefit of the doubt. His answers were informed by his years as a teacher in the school system. Of interest: his description of how excessive testing and paperwork interferes with students' educational experience. One thing I didn't understand: his passion for hierarchical skills. This isn't the first time at have heard him mention this. It's clearly a big deal to him. I'm not saying they aren't important. I just want to know what shapes his focus on this. that the community cares about right now, and who had not. It was extremely educational. Last night my blog crashed and I lost two hours of work on the BOE Forum . I'm going to try again this evening, with better back-up. Have a great Monday and think good thoughts about my blog rewrite tonight. On Thursday there were no such obvious howlers. The contrast was provided between the five challengers who are, I would suggest, more prepared than any other group of candidates before them, and the incumbent, who spoke more in generalities and cliches than to the specifics of the questions. It turns out that my notes were a lot sketchier than I thought while I was taking them. I ask your forgiveness--I'm presenting them here with only minor clean-up. Here is a summary of their five minute opening statements. Ellis: The job of the BOE member is to represent students, families, and community members as they develop programs in the Howard County Schools. Collaboration. Understand how local government and state government play a role. We can look at special programs, IB programs. Cutroneo: involvement began with mold and health issues at Glenwood Middle School, then connected with other parent advocacy groups. Decided to run for Board because she realized that change needs to come from within. Spoke to the issue of starting school later. Health comes first. We will need public input. Miller--experience as a teacher and parent. As a teacher was told he can't speak out, could be charged with insubordination. Too much testing and other intiatiatives mean time and money wasted. There's much to improve. ESM --the world language piece causes a problem with continuity at middle school level. It's also extremely expensive. Teachers need flexibility to do their jobs well. Departmentalization makes that difficult. Coombs--school parent, member of Citizens Operating Budget Review Committee. Recommends reconstituting that committee. spoke about importance of paraeducators in K especially. Make better choices with our money. Chose to speak to issue of redistricting. Mentioned Howard High school. Suggests taking current politics out of redistricting. Certain numbers would trigger decisions. There should be a decision matrix. High schools are not included in APFO, should be. Siddiqui- diversity. strong schools. I advocate for children. The science of learning. I have access to Johns Hopkins. (Medical data?) Mitochondria. Racial bias gender bias etc. disturbing. Unconscious bias training. Working together with the community. Early college program. ESM. Achievement gap. Input in redistricting. I understand challenges of families. Delmont-Small: Got involved as a parent, as a PTA member, then led PTACHC. Saw voices of parents pushed to the side. COBRC: gave her Insight into budget. We don't really know how we are spending the money received from the County. A budget document is a policy document. Ask the hard questions. Solve problems, create solutions. Helping people work together. She spoke to the issue of creating accountability by district. Term limits. Build new leaders. Bringing in new people to be a part of the solution. As a concerned parent and a community blogger, I was excited to see the issues that concern me most come up over and over again: responsiveness, transparency, and accountability. It was remarkable to see the five challengers share so much consensus on this, while showing through their answers how their particular experience shapes their ideas addressing problems and crafting solutions. I found it difficult to judge Dr. Siddiqui because her presentation style is rather flat. Her delivery is, on the whole, so lifeless that one is left wondering why she wants to continue on the board. That, however, is a matter of style. In the area of substance, she has the advantage/disadvantage of having a record that can be checked. More on that tomorrow, when I reconstruct the Q and A part of the forum. A tip of the hat to Columbia Villages for sponsoring the Forum, Oakland Mills for hosting, Jonathan Edelson for handling the MC duties, and the folks from the Mediation and Conflict Resolution Center at HCC for running the Q and A so efficiently.